Awesome. Molds to your neck. So comfortable and affordable. Love the removable Bamboo cover for washing. Amazing purchase. Delivery was quick . I will be purchasing more just like this in the future because the pillow is holding up well. THE BARE FOAM PILLOW: Comes with one fully adjustable standard foam pillow measuring 20"x26". 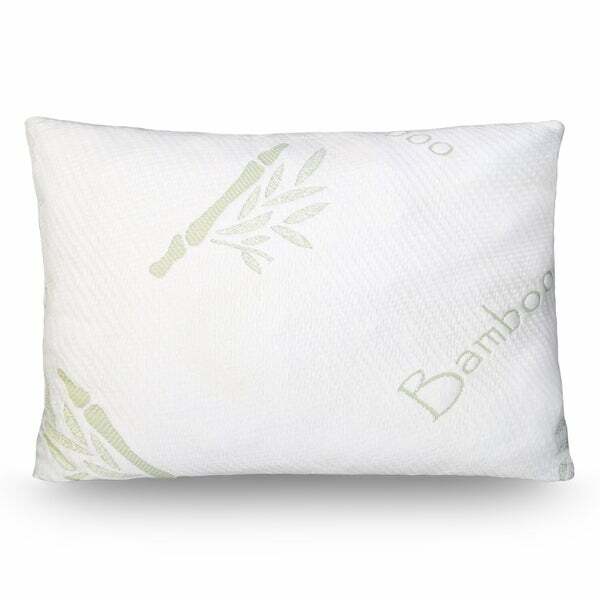 A soft and breathable, white, bamboo 60/40 rich cover with easy zipper closure holds the premium shredded foam in place allowing for as little or as much adjustment as desired. CUSTOMIZABLE & ADJUSTABLE: Our shredded foam pillows offer superior and fully customizable support. Each pillow will arrive with enough filling for an extra firm place to lay your head while the easily removable foam can be adjusted for those needing the softest experience. Just unzip the outer cover and adjust as needed. This pillow will never go flat! EXTRAORDINARY COMFORT & SUPPORT: With the filling customizable, our pillows offer the perfect support for your neck and head. Enjoy the perfect firmness and sink as well as even distribution throughout the night with a pillow designed especially for you. Great at keeping the body aligned for back, stomach and side sleepers alike! REST EASY: Bare foam pillows are made without CFCs, formaldehyde, TDCPP, PBDEs, TCEP flame retardants or heavy metals. Foam filling dries easy and helps resist mold, mildew and dust mites. Great for allergy sufferers! Rest assured knowing your pillow is made from the good stuff. EASY CARE: Our adjustable shredded foam pillows are machine washable. Just pop them in on the gentle cycle with cool water and tumble dry low. Please allow 24 hours for pillows to expand after first opening or washing.